Welcome back to another Sleepy Hollow Round Table! Moloch nearly crossed over via a knocked up Katrina this week. Henry's plan was foiled by Franklin's aurora borealis prism... or was it? Did you ever imagine Henry's Jincan would be used to impregnate Katrina with Moloch himself? Whitney: I did not see that coming and I thought it was a great reveal. But I knew they wouldn't kill Katrina this soon, so while it was an interesting twist, I kind of figured it wasn't going anywhere this week. Jim: I was as surprised as Whitney was that it was Moloch she was preggers with. However, unlike Whitney, I wasn't sure if Katrina was going to survive or not. But, I'm glad she did. Stacy: No I didn't assume that it would be Moloch, but I also wasn't super surprised when they revealed it. I also didn't believe they'd kill Katrina this early and hey, Ichabod learned CPR! Hank: The FOX teaser spoiled the pregnancy plot for me ugh! Then of course, like Henry said why would it be any demon when Moloch himself is itching to cross over. So yeah, I expected it. Whitney: I enjoyed the quick little scene with the dial up Internet. Hearing that sound brought back so many memories and I loved that he compared it to a swine being strangled. Jim: Ichabod going on about voting and how Washington use to buy beer for people voting. Was a fun tie-in to it really being a voting day. Stacy: The whole scene at the polling place. 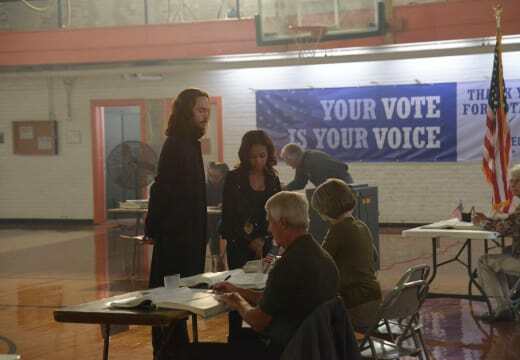 I liked Ichabod's comment that people will vote for American Idol but not come out for elections. 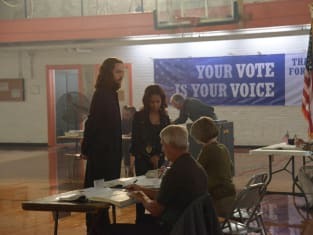 I laughed out loud when Abbie slapped the "I voted" sticker on his chest. Hank: I'm with Stacy... "I fought through lines of British regulars for the right to vote. Yet our modern countrymen can barely form a line. Of course, they're more than passionate to vote for American Idolatry." That was awesome! Is the vision of Jeremy running through the woods a sign of hope? Can he be redeemed or are Katrina and Ichabod blinded by love? Whitney: I'm still not seeing the Henry redemption story. I know we get little glimmers in his eyes and pained expressions when he looks at his parents, but he commits himself to Moloch time and time again and I can't see that changing. It's a testament to how good John Noble is that he plays Henry as more than just a one note evil mastermind, but in the end I think the evil will win. Jim: In order: No idea, probably not, and absolutely. By that I mean, I have no idea if it is really a sign, Ichabod maybe seeing signs where there are none. I don't think Henry can be redeemed, then again, who thought Darth Vader would come around? Finally, Of course Ichabod and Katrina are blinded by love. How many people over the years have stayed in abusive relationships because they were blinded by love? Stacy: Is it bad if I don't want Henry to be redeemed? It seems like the writers are trying to plant the seed that it may eventually happen, but he's done so many bad things that I can't see him doing anything that would be enough to redeem him. I definitely think Katrina and Ichabod are blinded by love and its good they have Abbie as the voice of reason. Hank: I agree with what everyone said. Though the redemption story is being hinted at by the writers, I don't see it happening. Besides, John Noble plays such a delicious villain. Why make him a predictable good guy? True about Darth Vader but I'm still hoping he stays evil Jim. What did you think of Benjamin Franklin's role this week and his aurora borealis prism? 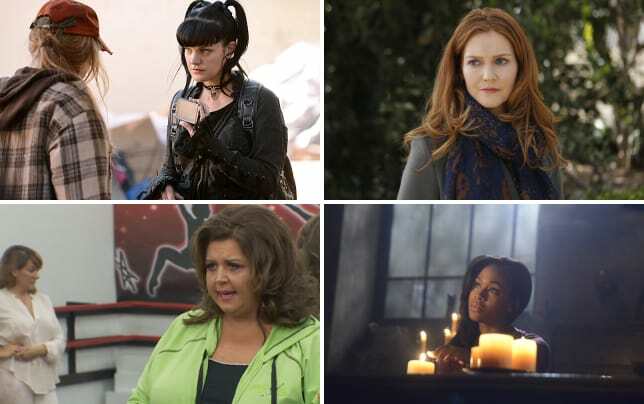 Whitney: I never really gripe about the implausible things on Sleepy Hollow because it's so entertaining but this was the first week in a while I thought the ending was too convenient. I mean, good thing it was sunny outside! Jim: It fit in with the basic nature of the show of: Someone in history did something to prepare for the end of the world and Abbie and Ichabod find out what it is just in time... But, that is ok, we've come to expect it by now I think. Stacy: I agree with Jim. We've all basically come to expect this kind of stuff at this point. I didn't find it to be their most entertaining historical tie-in though. Hank: Honestly, I'm still confused why the "aurora borealis" effect stopped Moloch from crossing over. As far as Franklin, I love that Ichabod despises the man yet he's saved the day several times. Go Ben! Is Moloch's essence now in that jar? Was that Henry's true plan all along? Whitney: It does seem like Henry is always one step ahead and if the look on his face at the end is any indication, something about that whole ordeal went right for him. Jim: I'm not sure if it was his plan all along, but clearly he was ready in case it happened. As for Moloch's essence in the jar, well I guess we will find out together. Stacy: If it was his plan all along, does that mean we believe Henry never intended for Katrina to be killed? Pretty close call if that's the case, so I'm going to say it probably wasn't his original plan. However, it does seem that Henry is always prepared for anything. Hank: I'm going to say yes, the plan was never for Katrina to give birth and die. She was merely the vessel holding Moloch's essence until Franklin's prism was located. Henry seemed pleased Ichabod figured it all out. He knew the pregnancy would lead our heroes to Franklin's prism and ultimately the jar would capture Moloch's spirit. Don't forget guys, if you've missed an installment and need to catch up you can watch Sleepy Hollow online via TV Fanatic!